Download "Table of Contents. Introduction. Audience. At Course Completion"
2 Microsoft Exchange Router, Microsoft Office for Outlook client, Microsoft SQL Server, Microsoft SQL Server Reporting Services, Internet Information Services, and Active Directory. Identify the Hardware and Software requirements for the various Microsoft CRM deployment scenarios. Execute the pre-installation checklist requirements that must be in place prior to installing Microsoft CRM Server. Complete the Installation procedures for the Microsoft CRM Server, Microsoft CRM client for Microsoft Office Outlook, and Microsoft CRM Exchange Router. Complete the Post-installation review that verifies the validity of the server and client installations. Complete several Post-installation tasks, including loading of sample data. Configure Microsoft CRM business units, users, and teams. Understand and manage the Microsoft CRM security model, including security roles, privileges, and access levels. Execute the administrative tasks necessary to support the application, including database maintenance, XML importing and exporting procedures, maintenance of system customization settings, and Web configuration parameters. Redeploy a Microsoft CRM installation. Update a Microsoft CRM v1.2 installation to 3.0. Uninstall Microsoft CRM 3.0 server and client. Prerequisites Before attending this course, students must have a working knowledge of Microsoft Windows Server 2000, 2003, or Windows XP, Microsoft Exchange 2000 or 2003, Microsoft SQL Server 2000, Microsoft Outlook, Active Directory, and Internet Information Services. 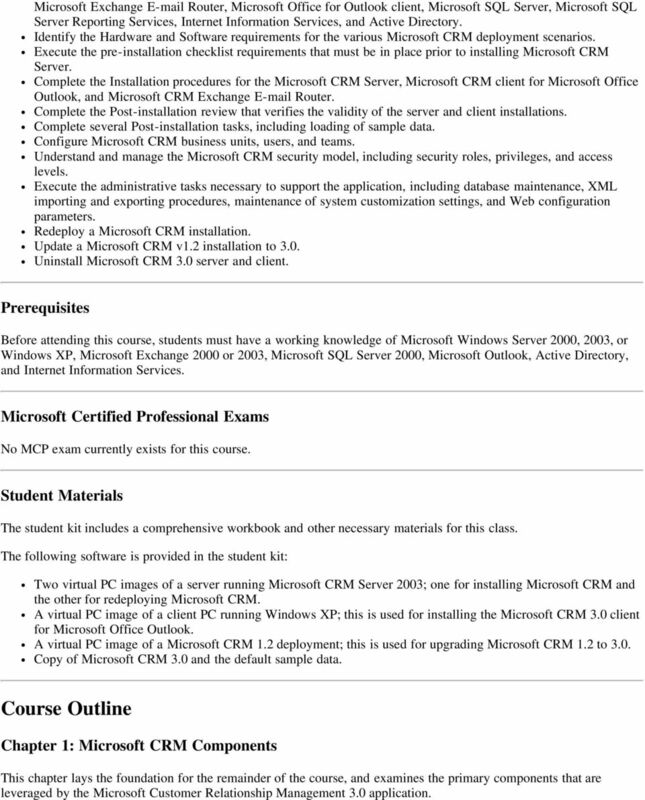 Microsoft Certified Professional Exams No MCP exam currently exists for this course. Student Materials The student kit includes a comprehensive workbook and other necessary materials for this class. 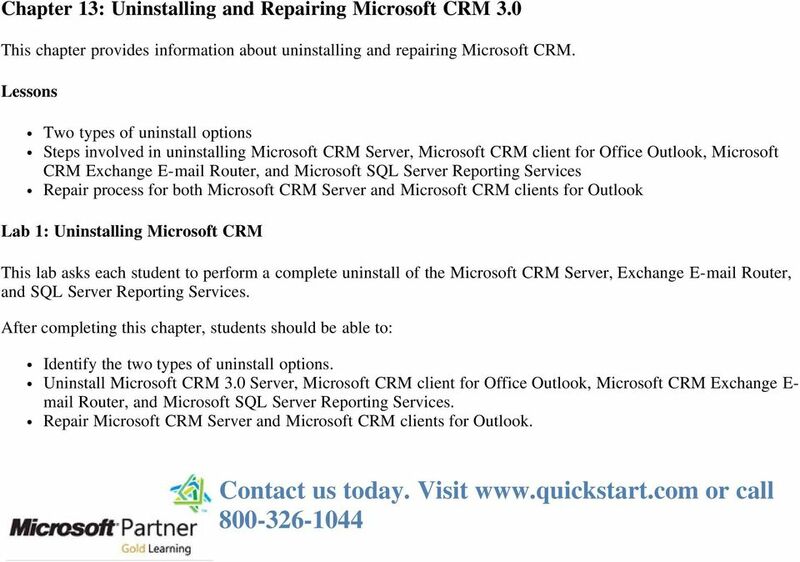 The following software is provided in the student kit: Two virtual PC images of a server running Microsoft CRM Server 2003; one for installing Microsoft CRM and the other for redeploying Microsoft CRM. A virtual PC image of a client PC running Windows XP; this is used for installing the Microsoft CRM 3.0 client for Microsoft Office Outlook. A virtual PC image of a Microsoft CRM 1.2 deployment; this is used for upgrading Microsoft CRM 1.2 to 3.0. Copy of Microsoft CRM 3.0 and the default sample data. Course Outline Chapter 1: Microsoft CRM Components This chapter lays the foundation for the remainder of the course, and examines the primary components that are leveraged by the Microsoft Customer Relationship Management 3.0 application. 3 Understanding the Microsoft CRM Components Microsoft CRM Server Microsoft CRM Clients Microsoft Exchange 2000 or 2003 Microsoft SQL Server 2000 or 2005 SQL Reporting Services 2000 or 2005 Active Directory Internet Information Services Lab 1: Activity - Fill in the Blank Exercise This activity asks each student to fill in the missing word(s) in a number of statements involving the components covered in the chapter. After completing this Chapter, students should be able to understand the role of the following components in a Microsoft CRM 3.0 deployment: Microsoft CRM Server Microsoft CRM Clients Microsoft Exchange Microsoft SQL Server SQL Reporting Services Active Directory Internet Information Services Chapter 2: Planning Your Microsoft CRM Installation This chapter examines the hardware and software requirements that must be in place prior to installing Microsoft CRM 3.0, as well as appropriate licensing plans. Planning your Microsoft CRM Deployment Hardware Requirements Software Requirements Supported Active Directory Configurations Support SQL Server Configurations Supported Microsoft Exchange Configurations Microsoft CRM 3.0 Licensing Model Staff Skills Review Lab 1: Activity - Matching Exercise This exercise asks each student to match the correct term with each statement involving planning issues. Analyze network infrastructure to ensure preparedness for a Microsoft CRM installation. Understand the hardware and software requirements for each component of the Microsoft CRM installation. Understand the new Microsoft CRM licensing model. 4 Understand the various Active Directory forest configurations supported by Microsoft CRM 3.0. Understand the Microsoft Exchange and Microsoft SQL Server configurations supported by Microsoft CRM 3.0. 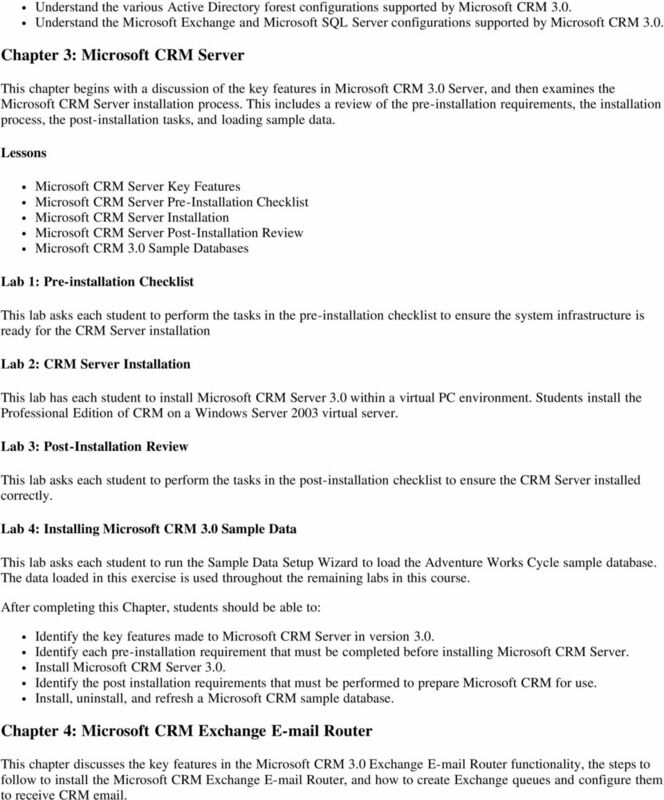 Chapter 3: Microsoft CRM Server This chapter begins with a discussion of the key features in Microsoft CRM 3.0 Server, and then examines the Microsoft CRM Server installation process. This includes a review of the pre-installation requirements, the installation process, the post-installation tasks, and loading sample data. Microsoft CRM Server Key Features Microsoft CRM Server Pre-Installation Checklist Microsoft CRM Server Installation Microsoft CRM Server Post-Installation Review Microsoft CRM 3.0 Sample Databases Lab 1: Pre-installation Checklist This lab asks each student to perform the tasks in the pre-installation checklist to ensure the system infrastructure is ready for the CRM Server installation Lab 2: CRM Server Installation This lab has each student to install Microsoft CRM Server 3.0 within a virtual PC environment. Students install the Professional Edition of CRM on a Windows Server 2003 virtual server. Lab 3: Post-Installation Review This lab asks each student to perform the tasks in the post-installation checklist to ensure the CRM Server installed correctly. Lab 4: Installing Microsoft CRM 3.0 Sample Data This lab asks each student to run the Sample Data Setup Wizard to load the Adventure Works Cycle sample database. The data loaded in this exercise is used throughout the remaining labs in this course. After completing this Chapter, students should be able to: Identify the key features made to Microsoft CRM Server in version 3.0. Identify each pre-installation requirement that must be completed before installing Microsoft CRM Server. Install Microsoft CRM Server 3.0. Identify the post installation requirements that must be performed to prepare Microsoft CRM for use. Install, uninstall, and refresh a Microsoft CRM sample database. 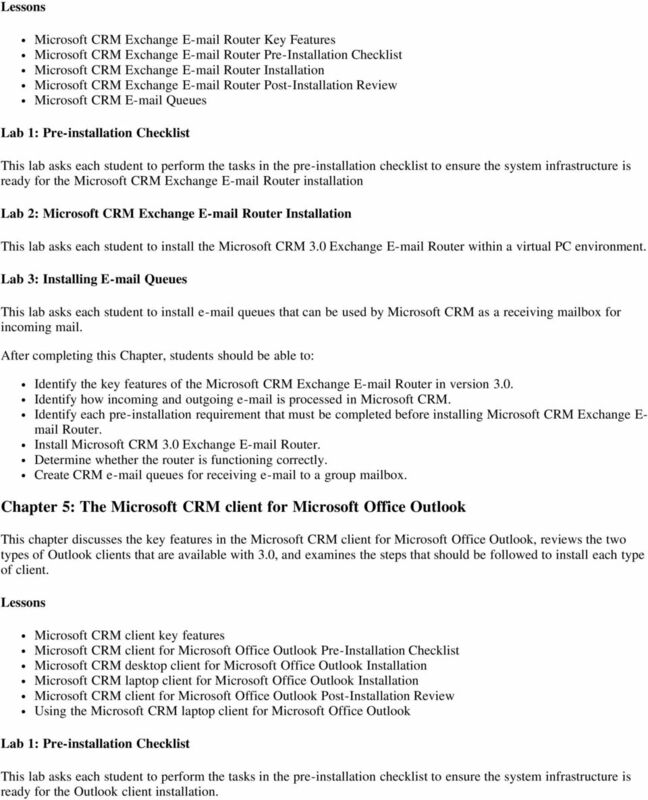 Chapter 4: Microsoft CRM Exchange Router This chapter discusses the key features in the Microsoft CRM 3.0 Exchange Router functionality, the steps to follow to install the Microsoft CRM Exchange Router, and how to create Exchange queues and configure them to receive CRM . 5 Microsoft CRM Exchange Router Key Features Microsoft CRM Exchange Router Pre-Installation Checklist Microsoft CRM Exchange Router Installation Microsoft CRM Exchange Router Post-Installation Review Microsoft CRM Queues Lab 1: Pre-installation Checklist This lab asks each student to perform the tasks in the pre-installation checklist to ensure the system infrastructure is ready for the Microsoft CRM Exchange Router installation Lab 2: Microsoft CRM Exchange Router Installation This lab asks each student to install the Microsoft CRM 3.0 Exchange Router within a virtual PC environment. Lab 3: Installing Queues This lab asks each student to install queues that can be used by Microsoft CRM as a receiving mailbox for incoming mail. After completing this Chapter, students should be able to: Identify the key features of the Microsoft CRM Exchange Router in version 3.0. Identify how incoming and outgoing is processed in Microsoft CRM. Identify each pre-installation requirement that must be completed before installing Microsoft CRM Exchange E- mail Router. Install Microsoft CRM 3.0 Exchange Router. Determine whether the router is functioning correctly. Create CRM queues for receiving to a group mailbox. Chapter 5: The Microsoft CRM client for Microsoft Office Outlook This chapter discusses the key features in the Microsoft CRM client for Microsoft Office Outlook, reviews the two types of Outlook clients that are available with 3.0, and examines the steps that should be followed to install each type of client. Microsoft CRM client key features Microsoft CRM client for Microsoft Office Outlook Pre-Installation Checklist Microsoft CRM desktop client for Microsoft Office Outlook Installation Microsoft CRM laptop client for Microsoft Office Outlook Installation Microsoft CRM client for Microsoft Office Outlook Post-Installation Review Using the Microsoft CRM laptop client for Microsoft Office Outlook Lab 1: Pre-installation Checklist This lab asks each student to perform the tasks in the pre-installation checklist to ensure the system infrastructure is ready for the Outlook client installation. 6 Lab 2: Microsoft CRM 3.0 laptop client for Office Outlook Installation This lab asks each student to create an administrative.msi image of the Microsoft CRM laptop client for Outlook setup program, publish it to all users via Group Policy Objects, and install it on a client machine in a virtual PC environment. 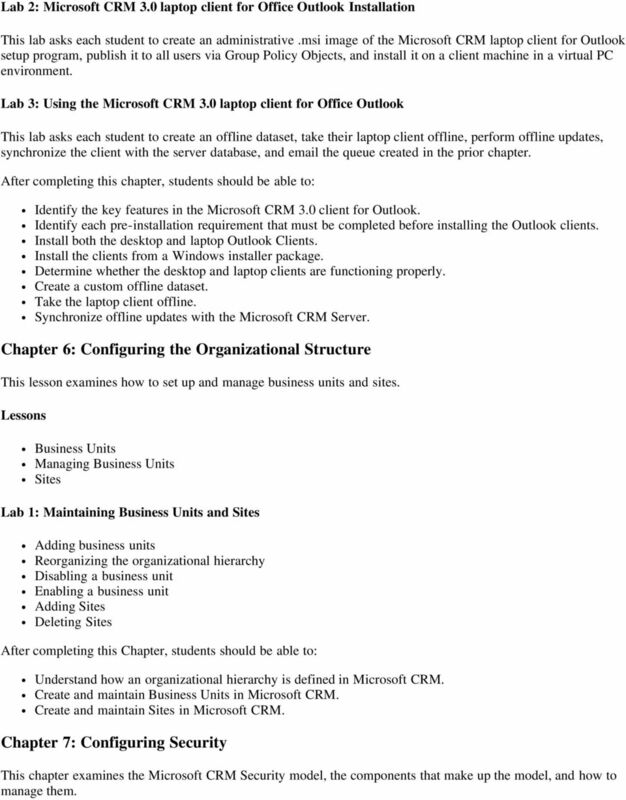 Lab 3: Using the Microsoft CRM 3.0 laptop client for Office Outlook This lab asks each student to create an offline dataset, take their laptop client offline, perform offline updates, synchronize the client with the server database, and the queue created in the prior chapter. Identify the key features in the Microsoft CRM 3.0 client for Outlook. Identify each pre-installation requirement that must be completed before installing the Outlook clients. Install both the desktop and laptop Outlook Clients. Install the clients from a Windows installer package. Determine whether the desktop and laptop clients are functioning properly. Create a custom offline dataset. Take the laptop client offline. Synchronize offline updates with the Microsoft CRM Server. Chapter 6: Configuring the Organizational Structure This lesson examines how to set up and manage business units and sites. Business Units Managing Business Units Sites Lab 1: Maintaining Business Units and Sites Adding business units Reorganizing the organizational hierarchy Disabling a business unit Enabling a business unit Adding Sites Deleting Sites After completing this Chapter, students should be able to: Understand how an organizational hierarchy is defined in Microsoft CRM. Create and maintain Business Units in Microsoft CRM. Create and maintain Sites in Microsoft CRM. Chapter 7: Configuring Security This chapter examines the Microsoft CRM Security model, the components that make up the model, and how to manage them. 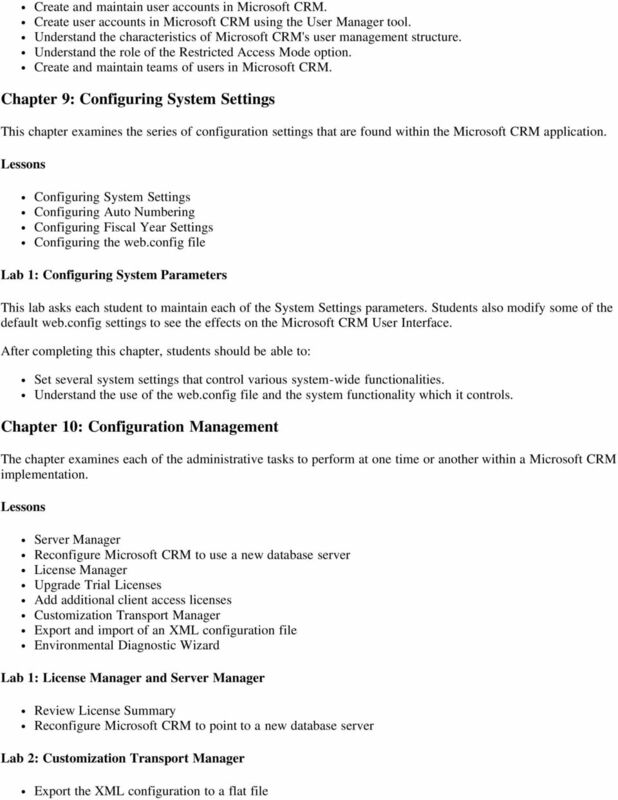 9 Import an XML flat file into Microsoft CRM and publish the configuration Lab 2: Environmental Diagnostic Wizard Run the Environmental Diagnostic Wizard Save the generated report for troubleshooting purposes Use License Manager to maintain licenses for an existing deployment. Use Server Manager to administer the Microsoft CRM server(s). Export the XML configuration to a flat file, or import a flat file back into Microsoft CRM. Run the Environmental Diagnostic Wizard and save the generated report. 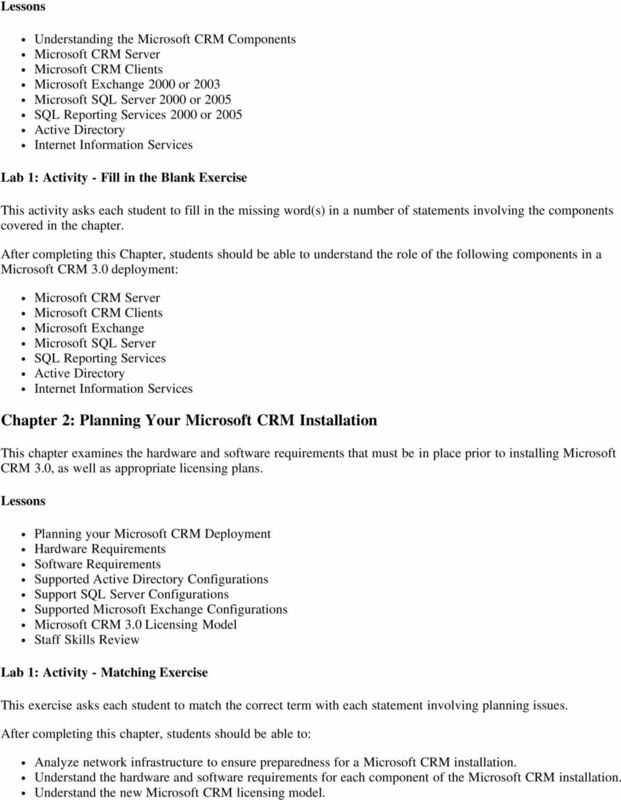 Chapter 11: Redeploying Microsoft CRM 3.0 This chapter provides information about redeploying Microsoft CRM. 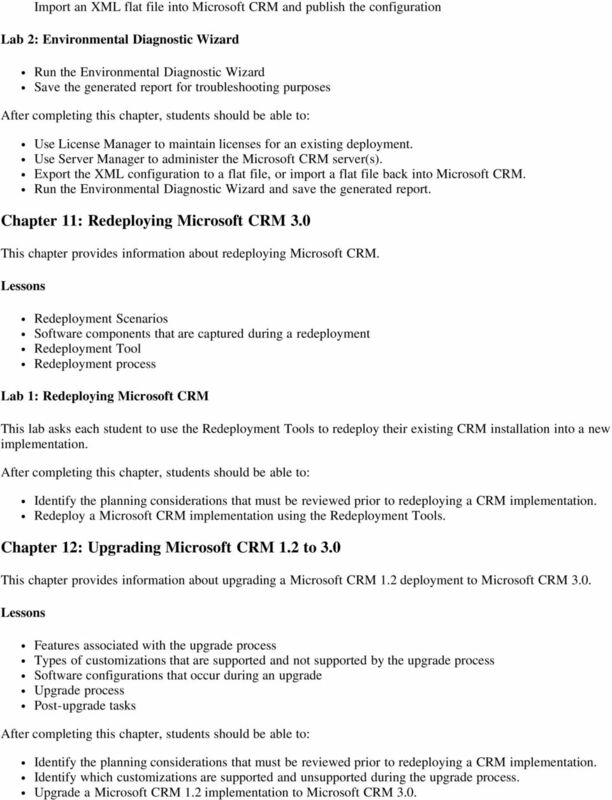 Redeployment Scenarios Software components that are captured during a redeployment Redeployment Tool Redeployment process Lab 1: Redeploying Microsoft CRM This lab asks each student to use the Redeployment Tools to redeploy their existing CRM installation into a new implementation. Identify the planning considerations that must be reviewed prior to redeploying a CRM implementation. Redeploy a Microsoft CRM implementation using the Redeployment Tools. Chapter 12: Upgrading Microsoft CRM 1.2 to 3.0 This chapter provides information about upgrading a Microsoft CRM 1.2 deployment to Microsoft CRM 3.0. Features associated with the upgrade process Types of customizations that are supported and not supported by the upgrade process Software configurations that occur during an upgrade Upgrade process Post-upgrade tasks Identify the planning considerations that must be reviewed prior to redeploying a CRM implementation. Identify which customizations are supported and unsupported during the upgrade process. Upgrade a Microsoft CRM 1.2 implementation to Microsoft CRM 3.0. INSTALLATION AND DEPLOYMENT IN MICROSOFT DYNAMICS CRM 2013 LENGTH : 2 DAYS OVERWIEW This two-day training course provides individuals with the skills to install and deploy Microsoft Dynamics CRM 2013. MS-8913: Microsoft Dynamics CRM 4.0 Applications. Course Objectives. Required Exam(s) Price. Duration. Methods of Delivery. Course Syllabus. 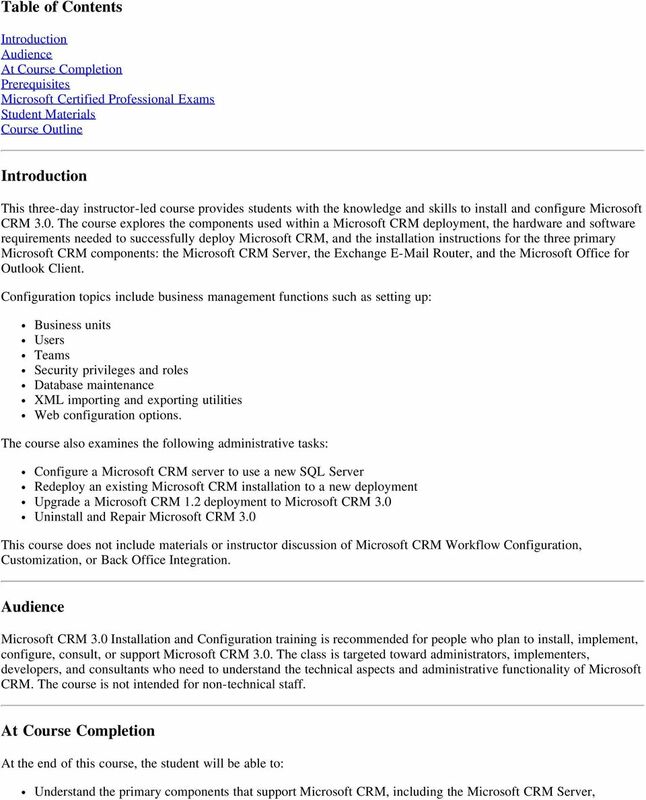 Course 6451A: Planning, Deploying and Managing Microsoft Systems Center Configuration Manager 2007. Key Data. This three-day instructor-led course provides students with the tools to extend Microsoft Dynamics CRM 4.0. Configuration Task 3: (Optional) As part of configuration, you can deploy rules. For more information, see "Deploy Inbox Rules" below. Course Syllabus. 2553A: Administering Microsoft SharePoint Portal Server 2003. Key Data. Audience. At Course Completion.